Wyldstyle: This doesn't make any sense. It's almost like... like we're in a video game? Batman: That is the single most ridiculous thing I've ever heard. This is your standard spoiler warning. If you don't want Lego Dimensions spoiled then I suggest skipping the Story section. In the early 90's my mother took the initiative to introduce me to several "older" cartoon series. It wasn't long before a very young Ghost became a fan of Scooby Doo, The Flintstones, The Jetsons, and Hong Kong Phooey. Naturally, because I loved these shows, my parents rented one particular movie... The Jetsons Meet The Flintstones. My brain wasn't quite sure how to handle this information. Up until that point in time, all of the entertainment I enjoyed was completely separate. You didn't have, for example, Bunnicula hanging out with Alf; I never saw Steve Urkel annoying Inspector Gadget . The thought had never occurred to me that people and things from two completely separate shows could meet each other, but there in my hands sat a copy of that very concept... and it was awesome! That very movie sparked a life-long love of crossovers. That's why I have so many people assist me with reviews on here (well that and laziness.) This love is part of the reason I adore the weird Scooby Doo movies, Kingdom Hearts, Super Smash Bros, and many other things of that nature. 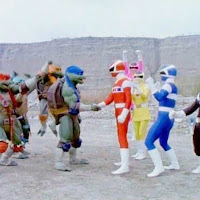 Heck, my love of this concept is why I can even smile and somewhat enjoy the stranger crossover concepts like Mario and Sonic at the Olympic Games, when the Ninja Turtles met the Power Rangers, and when Eminem and the Punisher teamed up. If the rumors are true, this Christmas we'll be getting a Doctor Who and Sherlock crossover and I can't even begin to describe how excited I am for that if it happens to be true (though part of me believes it is lies!) 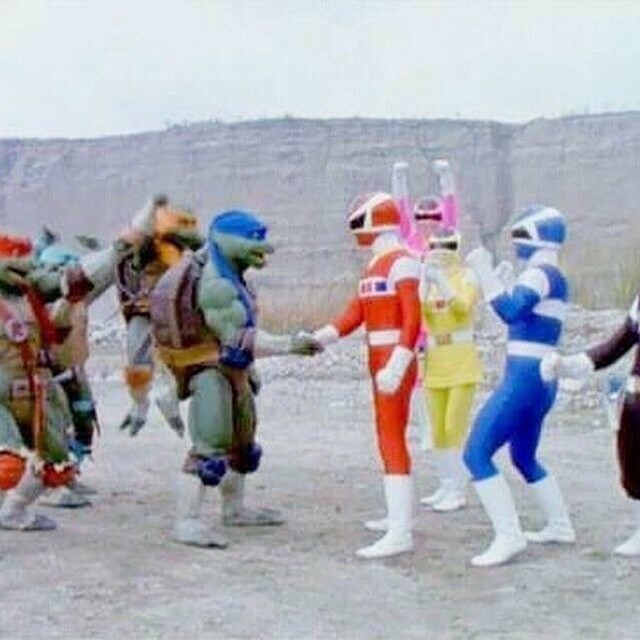 I adore when people bring two separate things together and how the characters interact with each other. I've said all that to say this. Lego Dimensions feels as though it was tailor made to my interests. It was as if someone sat down and examined my brain for the best combination of elements to create a video game specifically for me. Crossovers galore, franchises I love, franchises I appreciate even if I don't love them outright, the excellent humor and gameplay we have come to expect from a Lego Game... the list could go on! Basically there was absolutely no way I could walk away from this game without absolutely loving it. That being said, I'm going to be as objective as humanly possible about this so that you can see whether or not this game is for you. Just bear in mind that I was legitimately on the verge of "happy tears" once or twice through this game... so I'm battling the urge to go into a full fanboy praise session. Well that's enough gushing from me. Let's dive right in shall we. Huh? Yeah I read that right. Just so weird to be talking about building things in a game review. 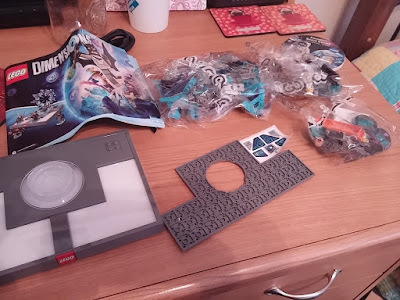 Lego Dimensions has brought to the table something which previous Lego video games haven't done... incorporating actual Legos for you to assemble. Now, I was never big on Legos as a kid. The few times I was exposed to them would be when friends would dump the contents of a large bin in front of me and want me to just use my imagination to build something. This generally ended poorly as I could never really tell how to make anything any more creative than a colorful log on wheels. Not to mention my experience with Legos was that they stuck together about as well as a pair of oiled river otters going down a water slide. These two memories combined meant that the prospect of building these things for this game was not inviting. Thankfully over the 20 some odd years since I originally played with the bins of Legos, the company has continued making improvements to the quality of their products/ I found that the building process was quite pleasant. The instructions were fairly clear and mostly easy to follow. I only messed things up about seven times, which is doing good for me. The process took about an hour to get the Game Pad, Gandalf, Batman, and Wyldstyle fully built, and as a general rule once the pieces were connected they didn't really fall apart like I was used to. While that was certainly surprising, I was more surprised to find that during gameplay the game pad portal actively changed. We were given instructions to build the game pad in a specific way then we would be prompted to move things around and re-assemble parts of it as the gameplay went on. However, one particular thing left me and other people baffled at first. While there were clear instructions on how to build the game pad and the characters, there were no instructions on how to build the Batmobile. The booklet didn't have any instructions or any mention of where we might find out how to build this vehicle. Since I purchased the game on the day of its release, information was limited. I went straight to the internet, as you do, and luckily I was able to find someone helpful on the Lego Dimensions Facebook page. He made a post to inform others that the instructions to build it were on the game disc and wouldn't be presented till we started the game. This was fine, but why wouldn't they leave us any information about that? Well it wouldn't be the first thing about this game they didn't inform us of. On the weird and desolate world known as Foundation Prime, a portal opens up. Stepping out of the portal is Lord Vortech, an evil man who has aspirations of ruling all of creation. Somewhere on Foundation Prime is the identification of each of the Foundation Elements. These Foundation Elements are items of significance spread across multiple worlds which would give access to the foundation of all dimensions once they have been gathered. Lord Vortech begins building a palace out of the material in Foundation Prime as he begins his conquest of the Foundation Elements and of all reality. Meanwhile in Gotham City, Batman and Robin are chasing down Bane who has stolen some kryptonite in order to defeat Superman. Robin manages to grab the kryptonite but a dimensional rift open sucking him into the void. Batman abandons his chase and drives the Batmobile in after Robin. Elsewhere in Middle Earth, The Fellowship of the Ring are crossing the bridge in Moria when the Balrog appears. Gandalf causes the Balrog to fall into the chasm and is dragged in afterwards. As Gandalf begins fighting the Balrog, the dimensional rift opens and the Batmobile comes flying through. Batman saves Gandalf with his grapple gun to the elation of Frodo. Unfortunately as Frodo runs towards them the rift re-appears sucking in Frodo and the ring. Gandalf and Batman follow. 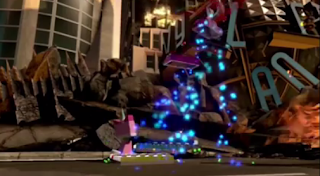 Finally in Cloud Cuckoo Land (Lego Movie), Wyldslyle and Unikitty are having a danceoff when a dimensional rift opens sucking in Metal Beard and his treasure and dumping Gandalf and Batman on them. 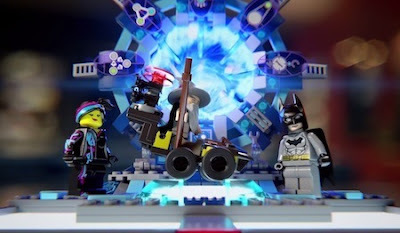 Gandalf, Batman, Wyldstyle, Emmet, and Unikitty decide to find out what's going on but a dimensional rift drags only Gandalf, Batman, and Wyldstyle into the vortex. The trio land in a strange dark dimension where a portal device is standing. However, their arrival shatters the device. Once they rebuild the portal, several pieces of the machine known as keystones get sucked into other dimensions. Jumping in after them, our heroes land in Oz to find the Wicked Witch in possession of a keystone. Our heroes track down the witch at her castle and defeat her, thus obtaining the first keystone. They return to the portal machine and install the missing piece. During this time it is seen that Lord Vortech has been opening rifts to different dimensions and gathering villains to work for him such as Saruman, and the Joker. 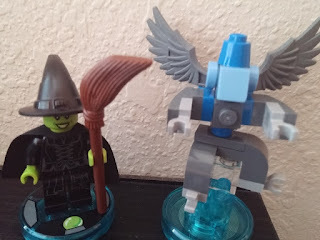 Gandalf, Batman, and Wyldstyle decide to finish finding the keystones which take them to the various dimensions of Springfield (The Simpsons), The Elemental Stadium (Lego Ninjago), Trenzalore (Doctor Who), and Metropolis (Superman). Once all the keystones are obtained and all of the various villains defeated, our trio arrive in Hill Valley 1885 (Back to the Future Part III). As they begin to rid the town of a local baddie, it turns out to be Lord Vortech who has taken matters into his own hands this round. Luckily, a dimensional rift opens and they are able to escape him. When they arrive back at the portal, Gandalf knocks over a piece of the machine which turns out to be a robot named X-PO who intends on helping them keep reality from falling apart. He instructs them that they should go looking for as many of the Foundation Elements as they can find before Lord Vortech can get his hands on all of them. Our trio then travel to Aperture Science (Portal 2), Middle Earth, New York (Ghostbusters), Midway Arcade, and Arthur Jones' Mansion (Scooby Doo) gathering the various Foundation Elements from those worlds. While in the Scooby Doo universe, the trio run into Lord Vortech as well who informs them that he doesn't need the elements because he has their friends. X-PO then uses the five elements to pinpoint the location of Foundation Prime so that they can rescue Robin, Frodo, and Metal Beard. Our heroes arrive in Foundation Prime and make their way to Lord Vortech's palace only to find that he had sent his minions to track down the dimensional portal. Vortech's minions smash X-PO and steal all of the remaining Foundation Elements giving Lord Vortech the ability to control all of reality. Using this new power, he begins pulling each dimension into a single dimension for him to rule. He also combines Metal Beard, Frodo, and Robin into one giant juggernaut known as "The Tri" aimed at destroying our heroes and their worlds. Batman, Gandalf, and Wyldstyle take on The Tri in the remnants of their own dimensions, eventually freeing their friends from Vortech's control. With their friends back, they recruit the Ghostbusters, Doc Brown, The Doctor, The Scooby Gang, and a slightly re-programmed GLaDOS to help them travel back to Foundation Prime and defeat Lord Vortech, trapping him in a perfect Rift Loop created by the Doctor. The dimensions are restored and all the worlds are saved. 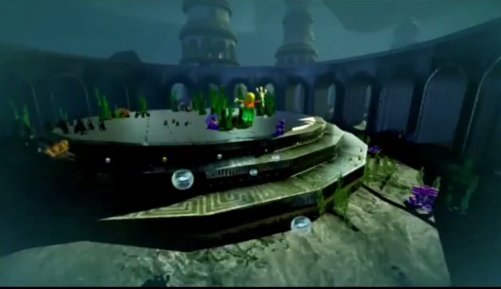 After the credits, however, a single piece of Vortech remained. Someone touches the piece and begins laughing with Lord Vortech's voice. The story campaign is quite enjoyable and solid. They found a perfectly good plot to facilitate travel between different dimensions. Sure, the plot didn't really have any big twists and wasn't exactly complicated but it didn't need to be! For what it needed to accomplish it was done very well. It honestly met my expectations... and that's about all I can say about that. I consider myself lucky to have played through both Lego Harry Potter games, and Lego Marvel Superheroes before picking up Lego Dimensions. This way I can fully appreciate the work that the developers and producers have put into the game. These people have nailed exactly how they wish for their games to actually play and are now actively taking measures to perfect their craft one improvement at a time. It's truly a spectacle to behold. 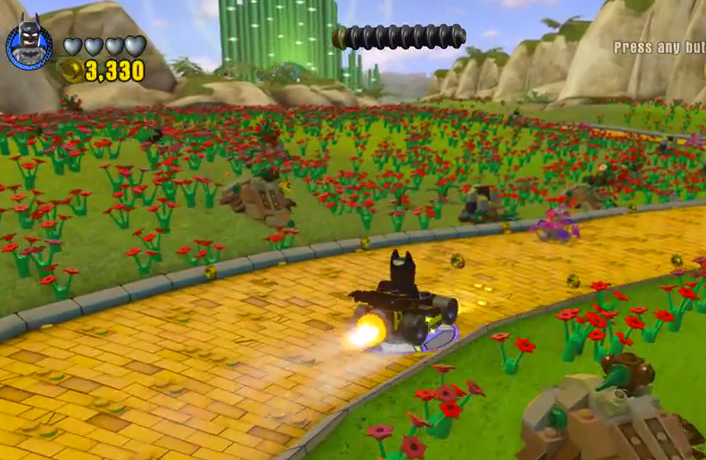 Lego Dimensions plays out exactly the way that other Lego games do. You have episodic missions to go through in which you must solve puzzles, fight off the villain's pawns, and fight bosses using a combination of combat skill and puzzle solving. Every playable character has his or her own strengths and abilities that help you solve different puzzles throughout gameplay. None of this has changed from any of the previous games I had played... it only got better. For example. In Lego Harry Potter, I could easily complain that having so many spell choices for each character became a bit of a confusing mess when facing multiple obstacles. I also complained that the partner AI basically did nothing to assist you in combat, the grumbling cave man talk was irritating, and that the flying mechanic was absolutely dreadful. By the time Lego Marvel Superheroes came around they had lessened the confusion with abilities by having more characters with fewer abilities to make things simpler. They also added real voice acting and dialog to the game while also making the partner AI actually assist you in combat. 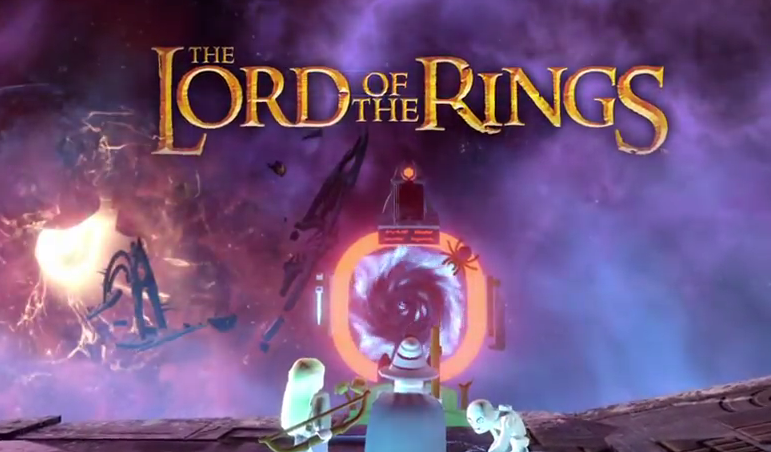 True to form Lego Dimensions takes it up a notch more. On top of Marvel Superheroes' enhancements, we also got better partner AI. The flying, driving, and swimming mechanics got a massive overhaul and are now incredibly easy to control and very intuitive with the ease that other games have these sort of features. It was truly a breath of fresh air to be able to fly and swim around without awkward button controls or unresponsive turns. They seem to be doing everything they can to make the gameplay as perfect as possible with two small exceptions. For some baffling reason the button to get into vehicles and the button to switch characters is the exact same button. Whoever thought this was a good idea was a complete idiot. I can't tell you how many times I have tried to get into a vehicle only to end up swapping characters; this can sometimes be detrimental in boss battles that require the use of vehicles as well. When you approach a vehicle the X button signal will appear above the vehicle. You're SUPPOSED to just hit X when that appears and get into the vehicle but in reality you just start controlling a different character. The only way I've found to get into a vehicle is run at it and keep running once you smack into the vehicle. As you're running stationary beside the vehicle then press X and you'll get into the car about 60% of the time. It's a joke! Also there are certain moments when you are prompted to use the Y button for a character's special ability and it just flat doesn't do anything. For example, I replayed the Simpsons level just the other day after getting additional characters to see what new secrets I could find in the level. During the final boss I found a station to the right that needed electricity. So I put my lovely Jurassic World ACU guy on the board and ran over there. The Y prompt appeared and I held down the button... then I held it down again, and again, and again, and again, and again. Nothing happened whatsoever! I stepped away from it to attempt it another way and still nothing. I spent a good five solid minutes just trying to do something that should be easy and responsive. Other than these two things, however, I didn't have any problems with the controls. The puzzles in this game were more intuitive than before. During my Lego Harry Potter review, I dedicated an entire section to the fact that some puzzles had difficulty spikes that would give people whiplash. I was constantly having to look guides up online to pass through several of the puzzles without having all of my money taken away from me. This time I legitimately only had so look up how to solve ONE puzzle, and that was simply because I didn't think the clue would have been on the boss' back (which was rarely turned my way.) That's not to say that all of them were easy by any means. There were still several difficult puzzles that took me quite awhile to solve, but I was able to solve all but one of them on my own with a little time and patience. One major addition to gameplay came in the form of the game pad. While we knew that the game pad was going to be used to actually use the characters we own in the game, I didn't know that we would also be using the gamepad to help solve puzzles. 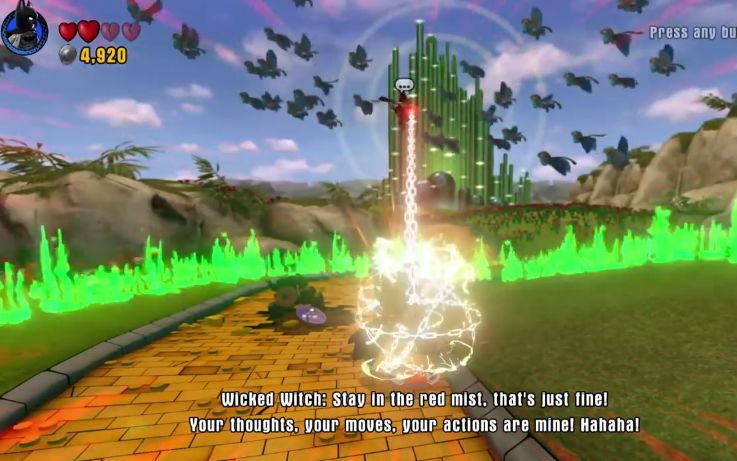 If an enemy has you trapped in a mind control or magic spell such as in the picture to the left, simply move the character to another spot on the game pad and they are released. Also, all of the keystones that you collected during the story give you additional powers that the gamepad helps facilitate based on where your character is sitting on it. Need Gandalf to illuminate a dark corridor? Place him on the portion of the pad that's lit up! Need to shrink or grow a character to get through a puzzle? Use the keystone and place the characters on the proper spot. It's a great addition and keeps up the interactive gameplay going throughout. I'm going to go ahead and apologize now if any of this section seems disjointed. In this game you can't really talk about certain aspects without mentioning other aspects; everything is sort of connected. As such I'm finding it a little difficult to keep a solid structure hence why I've lumped these two into one semi-long section. When it comes to the characters, I could possibly complain that you don't actually team up with characters from each dimension to progress through the level. In previous Lego titles, I would have assumed that to be the case. When we went to Wizard of Oz we should have added Dorothy to the team and her follow us into the next world where we then add Homer Simpson to the team etc. You don't do that in this game. You just simply use Gandalf, Batman, and Wyldstyle... and that's basically it from a story and playing standpoint. Now I am saying that I COULD complain about that but I'm not going to because I understand why this was not done. It'll take this whole section and possibly the next one as well to fully get out why I'm not complaining. 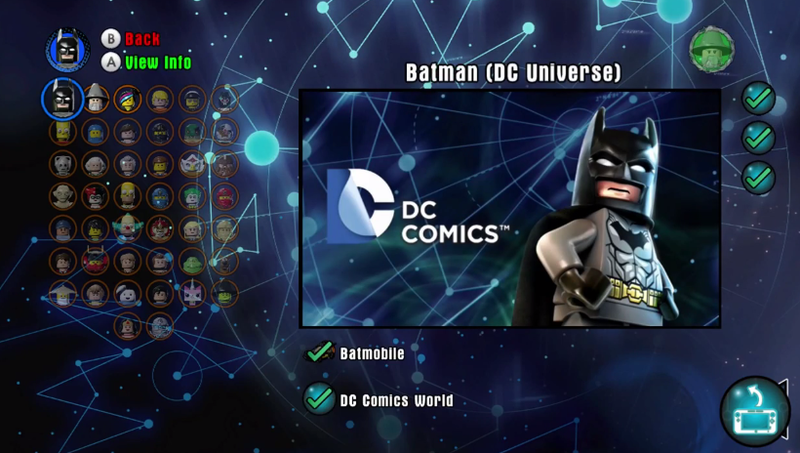 Lego Dimensions, unlike previous Lego titles, has given us a unique way of playing as certain characters. You must actually purchase each character you wish to play as at a retail store and place them on the game pad in order for you to play as that character. This does become pricey but I'll explain why it's not such a bad thing in a later section. Basically they have given us a smaller roster of characters with multiple different abilities for us to pick and choose the ones we wish to have. They have certainly given us quite the assortment. There are honestly too many to list them all but they are various characters from DC Comics, Lord of the Rings, The Lego Movie, Back to the Future, Portal 2, The Simpsons, Doctor Who, Ghostbusters, Midway Arcade, Jurassic World, Scooby Doo, Lego Ninjago, The Wizard of Oz, and Lego Chima. As of the writing of this, the production team have released forty one different playable characters for us to purchase and use between now and May 2016. Now why on earth would anyone want to purchase so many characters? Well the game actually provides you with a few answers to that. The first answer is the most obvious. With this many franchises, people will automatically purchase the characters that they really like. Even if they didn't provide anything additional other than just getting to use the character, I would have always purchased The Doctor, Cyberman, Peter Venkman, and Scooby Doo because I love Doctor Who, Ghostbusters, and Scooby Doo. Well that takes care of a few purchases but why would I want to get any more? Well the second answer is in the core mechanics of the game. Different characters have different abilities; certain puzzles require specific abilities in order to complete. If you want to be able to complete most if not all of the challenges and secrets in the game you're going to need many different kinds of characters so that they can perform different tasks. Now some characters come with a vehicle that once you upgrade and unlock their forms can give you more abilities than the base set but there are still several characters that you will need. For example, though I like Unikitty and Aquaman, neither of them were on my list of characters to purchase. However while playing the game I noticed that certain puzzles could only be solved by one of these two characters with no other options available. Similar instances were seen where I needed a Ninjago character or a Chima character for certain puzzles. Since I want to be able to do as much as I can in this game I'll be getting enough to be able to solve all of the puzzles. A third reason came in the form of Level Packs. While the Team Packs are just a collection of two characters and two items/vehicles, and the Fun Packs are one character and one item or vehicle, there is actually a third variety of pack called a Level Pack. These Level Packs include one character, an item, a vehicle, and an entirely new level to extend gameplay. Extra levels and extended gameplay? Who in their right mind would be opposed to that? But the level packs go beyond just that; they have actively fixed most of my mid-level problems with the game. I could have complained that out of all three Back to the Future films, they picked the third (and least favorite) one to have as a level...but the Back to the Future level pack gave us an entire level that was the first movie. I could have complained that the Simpsons and Ghostbusters levels weren't actually doing anything Simpsons or Ghostbusters related and were instead just reacting to the villains from the other dimensions gatecrashing their world...but the Simpsons level pack fixed that by basically giving me an entire episode of the Simpsons to have Homer go through. I assume the same will be true with the Ghostbusters pack when it comes out in January. 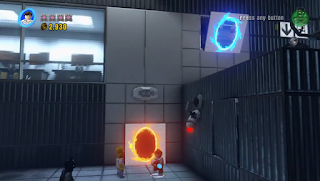 I could have complained that the Portal levels weren't exactly portal-ish because of a distinctive lack of portals...however like the others, the Portal Level Pack fixed that by giving us classic portal problem solving just like in Portal 2. The level packs are a must and are pure genius! The fourth reason came as a sort of surprise. In the other Lego games, once the main storyline was over, you were given the ability to explore the world and do additional puzzles. I figured that since there were so many dimensions in this game that things would be different. Well they were different...and better than I expected! On the main world where the portal is, you can take an elevator up to a large room with multiple portals in there. If you own a character from each of the worlds you can then explore the entirety of the universe of that character. There are dozens of puzzles and challenges in the open-world dimensions of each of these games and are quite amazing to explore. This is the main reason why I bought the Wicked Witch. I honestly didn't care to have her in the beginning but once I learned that you have to have a character from each world to access them I snagged her asap. All fourteen dimensions have a gate and once all the characters are released we'll have one gigantic game to explore. I wonder why this aspect of the game wasn't really mentioned in any of the advertisements because it's a massive feature! There's only one thing I can really complain about here and it's somewhat minor. There are three dimensions in the game in which we don't actually have any real levels: The Lego Movie, Lego Chima, and Jurassic World. Yes, I know that technically one level has a Lego Movie part to it but it's just a battle fought on the side of a building...it's not really a Lego Movie level and that's a shame. 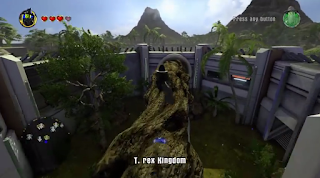 Chima and Jurassic World don't even get a nod in as far as a level is concerned. Now I do realize Lego Jurassic World and Lego Chima were very recent games and that's probably the reason they weren't given a level but it's still disappointing. Perhaps they will make additional level packs later to include levels from these three. Now you may be wondering how such a penny-pinching miser like myself would actually not be all that bothered by the sheer amount of money this game is going to ultimately cost me. It's true that I'm staring down a $500 barrel when it comes to this game in order to do everything that I possibly want to. It's also true that I tend to be Scrooge-eque about my money. 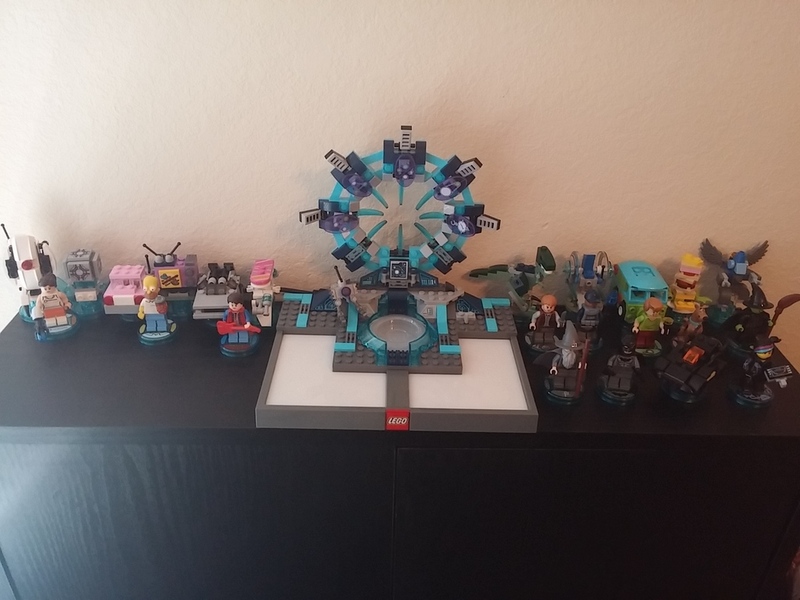 However I'm willing to shell out more money for quality than I am for quantity, and what we have here with Lego Dimensions is...well...both in all honesty. Companies have different mentalities on how to gain revenue. Some companies choose to release a new $60 title every year that has little to no change in gameplay mechanics aside from may one or two new features and a couple different costumes. Other companies choose the route of DLC for their existing games as they can charge 5 to 20 bucks per DLC packet which takes far less effort than creating a brand new game. When it comes to Lego Dimensions, they are taking the stand of getting their revenue from the sale of the individual figurine packs purchased after the game is bought. It's a risky position to have but I think it's going to pay off and here's why. The producers truly knew what they were doing when they created this game's hardware, both the game pad and the individual characters and vehicles. First of all, they have made sure there is plenty of stock on the shelves to purchase. There has yet to be a single time I've walked into Gamestop or Walmart and seen an empty spot in the Lego Dimensions section. This shouldn't really NEED to be a point I brought up, but Nintendo's amiibo debacle has made this a necessity. Second of all the figurines are universal. It doesn't matter if you have the WiiU, X-box 360, X-box One, PS3, or PS4 version. My Back to the Future set will work with anybody's game meaning that if you have a friend or neighbor who owns the game as well you can split the financial burden and only get half of the figures you need and share them. Lastly, they built the technology to look to the future. In an article by Eurogamer, associate producer Mark Warburton said that "We've got a three year plan at the moment and we've got no intention of stopping there." He also said "We've created the technology to the degree that we're happy it meets our needs for the future. We've created the toy pad so that it shouldn't need to be updated and we can just create new level and character packs to keep expanding that." In short, they have released information about characters and level packs till May of 2016 but sill have plans to expand that till at least 2018 without the need for a new expensive game pack. 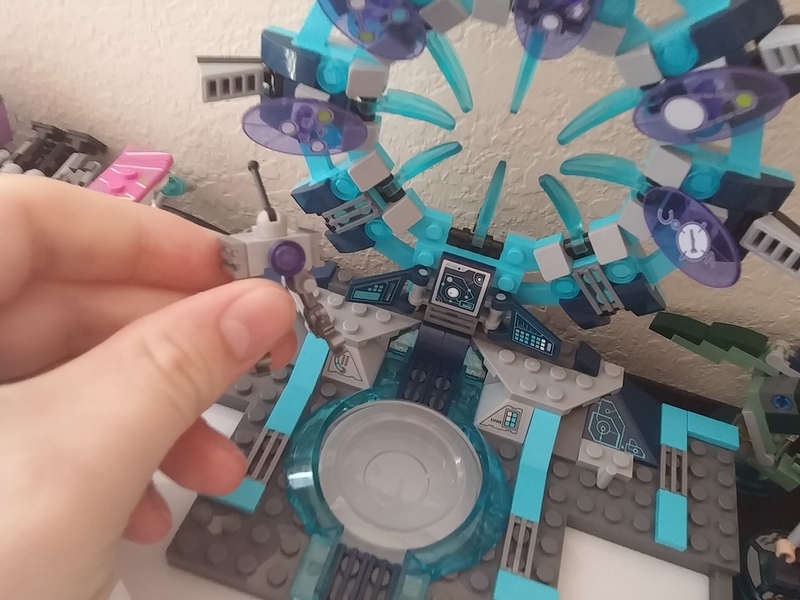 Heck they may even have a Lego Dimensions 2 and utilize the same game pad with maybe some extra pieces to change the portal some. They were really smart in the fact that they are actively trying to NOT betray your investment. They realize this is a lot of money and want to do all they can to keep your business and not have you dump hundreds of dollars just for the service or game to be forgotten. If more companies were like this I'd be more willing to shell out bigger bucks for games and systems. Welcome to Nitpick Corner. This section is all about the petty little nonsense things that I'd like to complain about but hold absolutely NO weight on my feelings of the game overall. Just minor irritations that are annoying enough to mention but not annoying enough to make me dislike anything in particular. Enjoy! No Place for X-PO - Once you reach the part where X-PO becomes a character in the game and is no longer just extra pieces on the portal, he doesn't actually have a place to go. There's nowhere for him on the game pad to really attach himself to or be a part of. He's just sort of there and falls off the game pad anytime I move it. I wish there was a little perch or something for him to be attached to so he doesn't keep falling. UPDATE: Actually you CAN attach him to the bottom right or left of the portal with the claw in his backside. Yet another thing they just didn't bother telling you in the manual that I had to learn on my own thanks to someone who commented on this review! Thank you Christian. Where's the T-Rex? - In the Jurassic World Dimension, I got so excited when I walked to a building labeled "T-Rex" I opened the door and walked up the stairs to the viewing area and....THERE WAS NO T-REX. They had a T-Rex building and you could even access the inside of the T-Rex pen but there was no actual T-Rex. They had the Mosasaurus in the lake so why not the iconic T-Rex?! Maybe you can do something to make her appear later or he's somewhere else that I haven't found yet but her absence was disappointing. 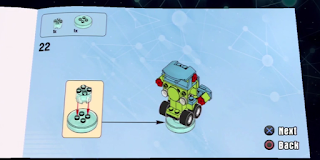 Vehicle Shenanigans - The advertisements for the game indicated that there were three different ways to make vehicles perform and that they did different things depending on how you actually built them. I thought that would be some IMPRESSIVE technology to be able to read exactly how you built the model..turned out it that wasn't exactly true. All vehicle instructions are on-disc and once you build it the information gets written to the base of the "toy" kind of like Amiibos in Super Smash Bros. However what you actually have your vehicle physically look like on the game pad doesn't matter...it's whatever design specifications you have highlighted when you decide to apply the upgrades/change. So I have a physical Mystery Machine that looks like the actual Mystery Machine but in-game when it appears it looks completely different because I want the water spraying capability. Kind of disappointing but at least I can have my Mystery Machine look like an actual van no matter what the game thinks it looks like. Metal Monkeys - Each fun pack gives you a character and a toy/vehicle. The Wicked Witch of the West came with a flying monkey. Flying Monkeys are already in the game as minions to fight...so WHY is her flying monkey a blank-faced robot that can't actually fly in its default form?! It's neat but bizarre. And there you have it. I hope you enjoyed Nitpick Corner! This game is fantastic. These people keep perfecting their games with every iteration and this is no different. It's not very often that I can review a game and have very little negative to say about it. Yes it's expensive but you're getting at least 3 years of continued effort towards that investment. Yes there has been some information that could have been explained better, but within a month or so all of your answers can easily be found online. Any remaining issues I have are either small or laughably insignificant. I'll go ahead and say it...this is my Game of the Year hands down. Actually if I had a PS4 that probably wouldn't be the case as I would be giving that title to Fallout 4 more than likely. However, in the absence of a PS4, Lego Dimensions is the must-own Game of the Year for me! If you like well balanced controls, puzzle solving, excellent humor, and getting to see crossovers between unlikely characters then you are probably going to enjoy this game. Yes it's expensive and you have to be on-board with the toys and gaming combination they've got going on, but if you can get past those two things then you're in for a real treat with Lego Dimensions. Even if this is your very first Lego video game or you have never been a fan of Lego, this has something for everyone and I highly suggest you look into this purchase for yourself or your children. Hey Ghost - never seen your site before but really enjoyed the Lego Dimensions review! I got it for Christmas and have been loving it for a lot of the same reasons. A certain locomotive turning up in a certain testing facility was a high point! Something to add to the list of 'stuff the game doesn't tell you' - it's not official or anything, but you can actually mount X-PO on one of the bottom left or right spokes of the portal. The top five spokes (top centre and the two on either side) have those little grey grilles on black hinge plates and the bottom spoke mounts it to the base, but the bottom left and bottom right ones are spare hinges that the little claw at the back of X-PO can be mounted on. He's out of the way of where the figures need to go for the game, but still very close to the portal and held secure. Worth a try if you haven't spotted this deliberate mistake (!) yet anyway. Holy Crap! I haven't ever noticed that. Immediately ran over to where my portal is displayed and attached X-PO as you said. MUUUCH happier with this revelation, thank you very much. Glad you enjoyed the review.